On Friday, I went to Tate Britain, one of my favourite places. I had two paintings in mind which I thought might make an interesting blog but, to my dismay, they weren’t hanging where they should have been. A gallery attendant told me that they were on loan to Canberra, and wouldn’t be back until October. Disaster. It was Friday and I needed a blog for Sunday. Fortunately, Fate stepped in in the person of Susan Seth, an Art tour guide, actor, singer and theatre archive explorer. She was about to give a ten minute talk on John Singer Sargent’s 1889 portrait of the actress Ellen Terry as Lady Macbeth, one of her most famous roles. She gestured towards the picture behind her. Would I like to stay? At least Sargent’s portrait was here and not in Canberra, I thought as I sat down. Susan began by reminding us that it was International Women’s Day and she would be exploring Ellen Terry’s life as an immensely talented women who was largely the creator of her own success. I had a slightly different agenda; blogs are best kept short, or at least, shortish. I decided that I would concentrate on the painting itself, its subject, the famous actress, Ellen Terry (1847-1928), and how she saw the role of Lady Macbeth. The portrait in front of me was on a grand scale, 221 cms. (7 ft. 3 in.) high. Sargent painted Lady Macbeth holding King Duncan’s crown above her head as though about to crown herself; she towers above the viewer forcing us to look up to her. Sargent had been trained in Paris under Carolus-Duran and I found myself wondering if he’d had the image of the coronation of the Emperor Napoleon, who’d seized the crown from the archbishop and crowned himself, in mind. It was certainly not a gesture in Irving’s production, or, indeed, in Shakespeare’s play. But Carolus-Duran would have known about Napoleon’s self-crowning – and Sargent had been studying in France for some years and his French was fluent. 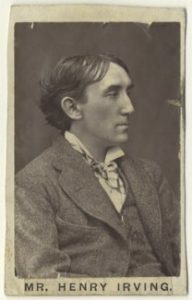 Henry Irving (1838-1905), one of the 19th century’s greatest actor managers, who played Macbeth, originally wanted a softer, more feminine Lady Macbeth. Ellen Terry, however, had other ideas. Her Lady Macbeth would have something of the serpent about her, strong, dominant – and evil. The moment Macbeth tells her of the witches’ prophecy that he is destined to become king, she sets about plotting Duncan’s murder. From then on, she is an obsessed and driven woman; no feelings of pity or compassion stand in her way. And we see this in her costume. Lady Macbeth’s spectacular gown was especially designed for her by the theatrical costume designer, Alice Comyns-Carr, who was associated with the Aesthetic movement. It was actually made by Ada Nettleship who crocheted the gown in green wool and blue tinsel yarn so that it looked like chain mail. 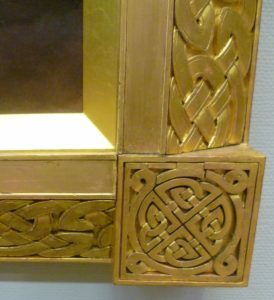 Their correspondence with Ellen Terry shows how closely they all worked together. Irving had wanted her to wear proper corsets, as befitted a Victorian lady; Ellen Terry refused. (Alice Comyns-Carr, who believed firmly in Rational Dress, would certainly never have countenanced a corset.) To get the barbaric effect Ellen wanted, Ada Nettleship decorated it with 1000 iridescent wings from the green jewel beetle, sternocera aequisignata. Her appearance was magnificent: long plaits of deep red hair fell from under a purple veil over a robe of green upon which iridescent wings of beetles glittered like emeralds, and a great wine-coloured cloak, gold embroidered, swept from her shoulders. It makes a wonderful story but it isn’t quite true. Ellen Terry had insisted on having her own costume made to her own specifications. 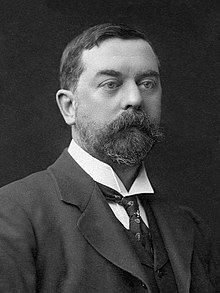 The costume designer for the Lyceum Theatre, who designed the rest of the costumes for Macbeth, was Charles Cattermole. 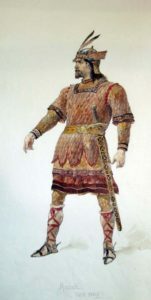 The design above is Cattermole’s for Macbeth’s costume, and I certainly wouldn’t call it at all homespun. It seems to me a suitably classy outfit for a noble Scottish thane. 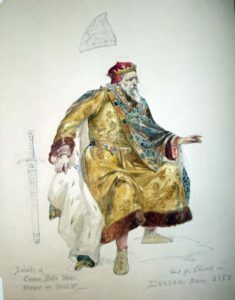 Charles Cattermole’s costume for King Duncan looks quite as exotic as Lady Macbeth’s. His robe looks as if it’s made of embroidered silk – and definitely bought in Byzantium. It seems that Walford Graham Robertson allowed a good Oscar Wilde anecdote to obscure the truth. So what made John Singer Sargent want to paint Ellen Terry’s portrait as Lady Macbeth? In some ways they were kindred spirits. Neither of them had had a formal education. Ellen Terry came from a travelling theatre family. As one of eleven children, she had to help support the family financially, and her first acting role was as Mamillius in Charles Kean’s production of The Winter’s Tale in 1856, when she was nine. There was no time, or money, for schooling. 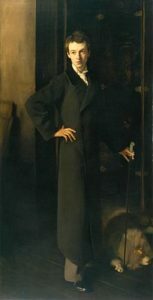 Sargent, too was home-schooled. His parents were American and they came to Italy after a family tragedy. Sargent was born in Florence and had a peripatetic childhood. He spoke fluent English, French, Italian and German and read widely but he never went to school. His talent as an artist, however, was quickly recognized when he went to Paris to study under Carolus-Duran. He, like Ellen Terry, needed to earn a living, and portrait painting paid the best. His portrait of Madame Gautreau in 1884 was a succès de scandale with her dress’s plunging neckline, her shockingly white powdered skin and her arrogant bearing. Originally, her right-shoulder strap was painted having slipped off her shoulder in a suggestive manner. Even in sophisticated Paris it caused an uproar. Sargent painted it out and put the strap in a more decorous position but the damage was done; his portrait commissions dried up. 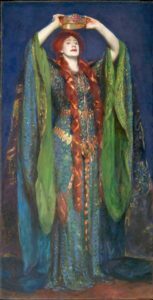 Sargent came to London and found in Ellen Terry another subject worthy of his attention. He obviously liked strong-minded women, and didn’t object to a touch of scandal. Ellen Terry’s personal life had its own scandals – she had had two illegitimate children by the architect E. W. Godwin. The resulting portrait was a sensation. And painting one of the most notable women in London in such a dramatic pose did his reputation no harm at all. The portrait remains, surely, one of the most dramatic paintings, in every sense of the word, in Tate Britain. I really enjoyed Susan Seth’s lively and fascinating talk and the first thing I did when I got home was to tweet her my appreciation. Thank you for your comment, Anne. I’m delighted you enjoyed the post. I’m sure you’ll be pleased to hear that the actual Lady Macbeth costume still exists; it was conserved at vast expense a few years ago and is now at Smallhythe, Ellen Terry’s house in Tenterden, Kent. It’s a National Trust property and open to the public. I don’t know if that’s the house you visited. Perhaps the PhD student’s replica was used as a stand in while the dress was being conserved. Wonderful. Am a huge admirer of the whole Macbeth theatre tradition as well as the true story. I have a novel based around the ghost of Macbeth (For One More Tomorrow) and I researched for that, as well as having written and directed a play for school based around Macbeth (Directing Macbeth). He’s such an enigma and she is a wonderful character, in the end unable to endure the guilt about the monster she has unleashed. Although Macbeth in the play behaves monstrously, he never for a moment pretends that he is justified in what he is doing. I love Shakespeare’s rendition of a man who has fallen too far into the dark side to be able to pull back, and who knows he is doomed. Nothing like the truth, of course. My Macbeth hero in the book loathes Shakespeare and appears to the director of the play, furious about being falsely portrayed…. you’ve set me off now! Yes, I can see I’ve set you off! It’s an interesting play – and very difficult to bring off successfully. I’ve seen some truly dreadful productions of it, mainly, I think, because the director gets hooked on the idea of ‘making it relevant’ or doing something wacky with it. As if Shakespeare can’t be trusted to deliver the goods nowadays. It makes me so cross. I know what you mean. I don’t mind “interpretations” being a director myself. Always interesting to see a new take on a classic. But that doesn’t mean I necessarily like what has been done. I agree it’s a tough one to carry off well. I suspect it’s not very well understood half the time. The two are often played as out and out villains which is ridiculous as it does away with all the nuances of character. Such a fascinating shift as she begins it while he is reluctant and then they cross over. I recently had an epiphany about the Tomorrow speech – in the shower! – and realised I had not fully understood how much grief there is in it. That’s the wonder of Shakespeare. You can read it, watch it and see it again and again and still find something new. I really love Shakespeare. I agree with Ben Jonson that ‘He was not of an age, but for all time.’ And, as you say, every time you see one of his plays, you see something new in it, even if you know it really well. Thanks for an interesting post, Elizabeth. I visited Smallhythe a few years ago. I didn’t know much about Ellen Terry at the time, but really enjoyed learned more about her and her acting. This painting is fabulous though I suspect it would have been difficult for any decent artist to produce a dud portrait with such an fascinating subject and wearing an exotic costume to boot! Thank you for your comment, Gail. Lucky you, visiting Smallhythe. It’s now definitely on my ‘must see’ list. By all accounts, Ellen Terry, who was in her forties when she played Lady Macbeth, was a very strong-minded woman. Any artist who painted her would also need to be able to stand up to her, if necessary. I suspect that Sargent, a sophisticated man who was used to coping with bossy women – I’m sure that Madame Gautreau could be a handful – knew exactly how to treat the formidable Ellen Terry. I’ve always loved this striking portrait of Ellen Terry. Have you come across “A Strange Eventful History” by Michael Holroyd which examines the lives of Ellen Terry and the Irvings as well as the work of her son, Gordon Craig, in the theatre. Thank you for your comment, Pauline. I haven’t come across the Michael Holroyd book – it sounds really interesting. I shall keep my eyes open for it. Wonderful blog. I enjoyed it immensely. Thank you. I’m so pleased you enjoyed it, Anne. Mind you, Ellen Terry was an intelligent and witty woman which made my job as lot easier!